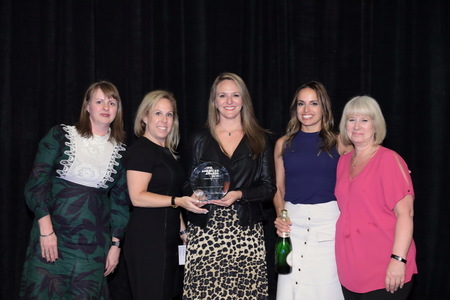 One highlight of the 2019 Summit of the Americas in Orlando was the announcement of the winners of annual 2019 DFNI-Frontier Americas Awards. Recognizing the best of travel retail across all channels in the Americas, entries were evaluated by a panel of expert judges – Antoine Bona, Erasmo Orillac, Giles Marks, Jackie McDonagh, Robin Rosenbaum-Andras and Walter Aguilar. The entries with the highest average score were named the winners, who were announced at the champagne reception event on Monday evening. Among the big winners were Starboard Cruise Services, which won three awards including Americas Travel Retailer of the Year, Cruise or Ferry Retailer of the Year and New Shop Opening of the Year for theCelebrity Shops on Celebrity Edge. DFS Group won two awards, including Airport Retail Operation of the Year (over 50 million pax) and Duty Free Experience of the Year. From Canada, Importations Guay Ltée (IGL) Duty Free also won two awards, for Border Store of the Year and for Charitable Initiative of the Year, which recognized its Streethearts Haiti campaign. William Grant & Sons won Supplier of the Year. Starboard Cruise Services won three awards.